Built with a 10.1:1 gear ratio, the new Abu Garcia Revo Rocket is among the fastest reels on the market. The trend toward lighter, faster and more durable reels continues with the stable of equipment that is being introduced this week in Orlando. Some models are brand new while others are old standbys that have undergone cosmetic and internal makeovers. Built with the same Hagane concept aluminum frame as the high-dollar Shimano baitcast reels, the SLX is the perfect option for anglers looking for a lightweight, durable and easy-to-use baitcaster. Spool and casting control is provided by a six-spin style Variable Brake System and the SLX comes equipped with a Curado K style long handle with power knobs. The SLX, which weighs 6.9 ounces, will be offered in three different gear ratios � 6.3:1, 7.2:1 and 8.2:1 � and all three will be available in right- and left-hand retrieves. In addition, a matching series of SLX rods � nine casting and seven spinning models � are being introduced this week. You�ll have to ask the fish that decide to bite a lure attached to the new Revo Rocket, Abu Garcia�s latest entry in the high-speed baitcasting reel category. Equipped with a 10.1:1 gear ratio that allows users to retrieve 41 inches of line with every turn of the oversized handle, the Rocket will be an option for flipping, topwater fishing and those looking to cover water � fast. Featuring a deep red color (matte finish) on each side plate, the Rocket has some serious curb appeal and is built with 10 stainless steel HPCR bearings along with one roller bearing. The reel is also built with an extended handle and oversized EVA knobs to offer additional power and control over the fish. The Beast is not a new addition to the Revo roster, but the latest version should build on its reputation as being a must-have for slinging big baits and hauling in big bass or other hard-pulling species. The Power Stack Carbon Matrix Drag System offers 30 pounds of drag pressure and the Infini brake system offers the flexibility to dial in the reel�s performance for whatever bait is tied on. The frame and sideplates are made of X2-Cr�ftic alloy, creating a stiff and sturdy skeleton to house the seven stainless steel HPCR bearings and one roller bearing along with the Duragear brass gear. Comes with a titanium-coated line guide along with an extended bent handle equipped with power knobs. Will be sold in 5.8:1 and 7.3:1 gear ratios in both right- and left-hand models. The Revo AL-F was engineered to give anglers a lightweight option to cover the gamut of lure options, from finesse baits up through heavy, bottom-hopping jigs. The aluminum frame is paired with C6 carbon sideplates and an aircraft-grade aluminum main gear to keep overall weight to a minimum. The 2-pin Infini brake system allows for a broad range of casting adjustments while the compact bent handle and flat EVA knobs make for an all-around comfortable high-performance low-profile reel. The AL-F will be available in 6.4:1 and 8.0:1 gear ratios in both right- and left-hand versions. With the help of former Bassmaster Angler of the Year and Bassmaster Classic winner Mike Iaconelli, Abu Garcia had developed the Ike Series conisisting of baitcast reels, spinning reels and technique-specific rods built to Iaconelli�s exacting specifications. The deep purple styling also will make them stand out in the a crowd, much like Iaconelli has for much of his career. The low-profile baitcast reel will come in 6.6:1 and 8.0:1 gear ratios to cover the range of retrieves and techniques commonly used by bass anglers. They�re built with 10 stainless steel ball bearings plus one roller bearing and, like the AL-F, feature an X2-Cr�ftic alloy frame. The C6 carbon palm sideplate and aluminum handle sideplate ensure the reel�s weight is minimized. The Power stack Carbon Matrix Drag System produces 24 pounds of drag strength and the Gull Wing sidelplate design allows for easy access to the spool and braking system. Offered in two sizes � 20 and 30 � the Ike Series spinning reels will give anglers plenty of options to cover all the spin fishing applications. Built with nine stainless steel HPCR bearings and one roller bearing, the reel also incorporates an integrated dropshot keeper to keep tangles to a minimum. It also features Abu Garcia�s rocket line management and rocket spool lip design to provide better line control, regardless if you�re using braided or fluorocarbon line. Like previous Abu Garcia spinning reel models, the Ike Series reels are built with a C6 Carbon body and rotor and come equipped with the Carbon Matrix drag system. Comes with round EVA knob. Meet Abu Garcia�s lightest and most compact spinning reel. It�s built with a CMg carbon rotor and one-piece X-Mag alloy gear box to reduce weight to 5.6 ounces (20 size) and 5.9 ounces (30 size). The AMGearing system is combined with HPCR and Salt Shield bearings for durability in a range of conditions. The reel is also equipped with a removable sinker keeper that eliminates tangling when using a drop shot. The bent carbon handle arm is finished with a corb knob and the reel comes with a protective EVA case along with a spare shallow spool, dust cap and two handle knobs. The Accurist has been among Quantum�s top-selling reels and the latest version incorporates an external ACS 3.0 cast control dial that allows for easy, precise adjustments on the fly. The frame of the Accurist S3 is all aluminum and the reel also features an old-school flippin� switch that�s a rare component on baitcasters these days. Built with nine bearing and available in two speeds � 6.3:1 and 7.0:1 � the Accurist S3 will be available in left- and right-hand models. The Helios line of reels has been a popular one for Okuma and the new-to-the-series SX model features some internal upgrades that allow it to stand out. It is built with a revamped 12-point adjustable velocity control system that makes backlashes a thing of the past. In addition, the friction free disengaging spool shaft system is designed to add distance to every cast. It will be available in 6.6:1, 7.3:1 and 8.1:1 gear ratios with the 7.3:1 coming in both right- and left-hand versions. The Japanese ABEC-5 spool, made of machined aluminum, pairs with a diecast aluminum frame and a larger handle to give the user more power. At the 2018 Bassmaster Classic, there was only one of these reels available and it was given a Classic Expo attendee through drawing in the Lew�s booth. Now, the Pro-Ti SLP is ready for others to get their waiting hands on it. Hyperbole aside, it�s the lightest, toughest reel to ever bear the Lew�s nameplate. It�s one-piece aluminum frame pairs with aluminum side plates that have a titanium composition. Its smooth operation and durability is a result of the Speed Gears being cut on a high-end Hamai (Japanese) CNC gear hobbing machine. The Pro-Ti SLP has 11 bearings and an externally adjustable 6-pin, 27-position QuietCast Adjustable Centrifugal Braking System that allow for quieter and smoother casting. Also comes with the patented Speed Dial line indicator and Speed Keeper hook keeper. 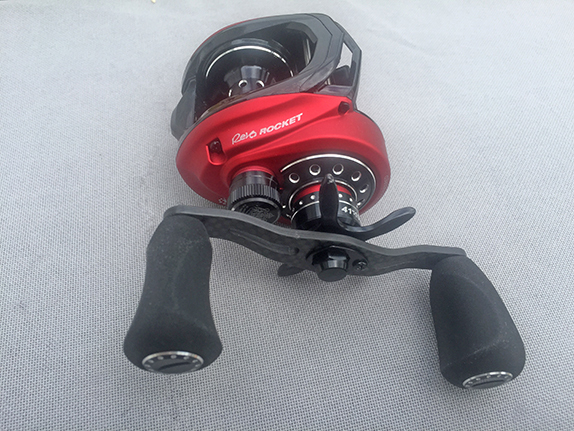 The reel has a 7.5:1 gear ratio and will be available in right- and left-hand models. Aimed at those who like to sling big baits on heavy line for brutish fish in fresh and saltwater, the Super Duty 300 is built on a one-piece aluminum frame and sideplate with a bowed, heavy duty 100mm aluminum reel with Winn Dri-Tac knobs. The reel has 24 pounds of carbon fiber drag along with a ZRXtra one-way clutch bearing, which uses zero reverse with a backup multi-stop gear to deliver more power and backbone. Solid brass Speed Gears turn the braid-ready, forged, double anodized, deep capacity spool and casting big baits is a breeze thanks to the externally adjustable Multi-Setting Brake (MSB) dual cast control system. Geared toward the saltwater crowd, the new Custom Inshore Speed Spin puts an emphasis on drag operation and corrosion resistance with a premium stainless steel 7-bearing system paired with an aluminum body/sideplate with a flush and drain port. High strength Speed Gears and a sealed carbon drag system means both power and smoothness when fish want to make a run in the opposite direction. A Winn Dri-Tac handle knob gives anglers power and comfort at their fingertips. Will be offered in three sizes � 200, 300, 400 � a 6.2:1 gear ratio standard across the series.